Morclean salt water pressure cleaners for Marine, shipping, oil and gas industries. Most of our range of cold water high pressure washers can be built specifically for use with salt water. The machines are built on a bespoke basis and are configured with additional stainless steel valves and components. 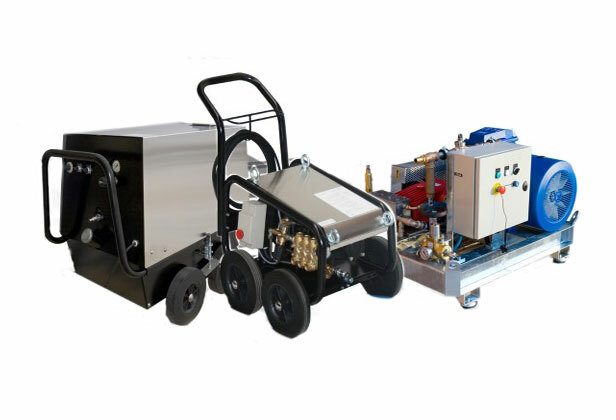 Salt water pressure washers can only be used with cold water, and our models include electrically driven (240V, 110V or 415V) or engine driven (petrol or diesel engine driven). All our models designed to be used with salt water can be both mobile or stationary, and generally we use stainless steel covers to prevent corrosion. Applications include shipping, off shore, marine, fishing vessels and oil platforms etc. High pressure cleaners for use with demin water can also be built on a bespoke basis. All demin water machines are built to order but include both mobile and static, hot or cold, electrically heated, and can also be built to ATEX standards. Deionised water (otherwise known as demin water) is water that has had its mineral ions removed (such as calcium, iron, copper, chloride etc). As the water impurities are dissolved, salts are removed. The resulting water is a high purity water which is typically used via a high pressure cleaner in pharmaceutical, laboratory or nuclear applications. Water can be demineralised using reverse osmosis, carbon filtration or ultraviolet oxidation, all features of our own range of water recycling equipment. (link to water recycling) Demin water is also used for high quality rinsing of cars or buses where a spot free finish is required. Due to the purity of the water, it will dissolve components such as iron or copper etc, so therefore our demin high pressure cleaners need to be built on a bespoke basis using only high quality resistant materials that will not corrode or dissolve due to the use of deionised water.